At Henry's Metal Polishing, Inc., we have provided top quality metal fabrication services since 1951. We serve our customers as a one-stop shop, with equipment that allows us to weld and finish complete projects on site. Our equipment and capabilities include free hand MIG and TIG welding for aluminum, stainless steel, and steel. We offer a number of different welding and related services, including pre-polishing, finish welds, repairs, and touch-up welds before finishing. We employ highly skilled and experienced welders that are available to provide repairs, including fixing incomplete welds pits or voids. 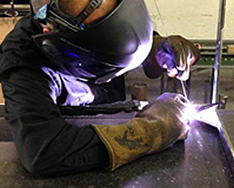 In addition to welding, we offer full engineering, production, fabrication, and assembly services. Full prototyping and research & development are available as well. Because quality is important to us, our welding meets or exceeds a range of stringent industry standards, including industry best practices and full ISO compliance. 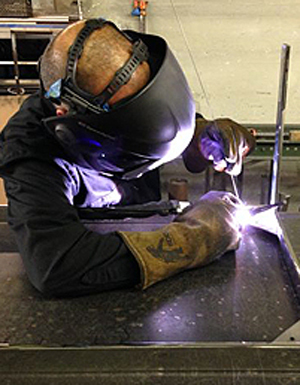 Our deep level of expertise and experience has allowed us to provide welding services for customers in a diverse variety of industries, from architectural, art, and commercial goods to construction, furniture, and food services. Finally, our welding services are used for applications as diverse as the industries they serve. We have welded tables, handrails, art sculptures, picture and doorframes, food processing equipment and furniture hardware among many other items. To find out more about our welding services, please take a look at the following chart, or Contact us directly. also referred to as Gas Metal Arc Welding. Also referred to as Gas Tungsten Arc Welding.